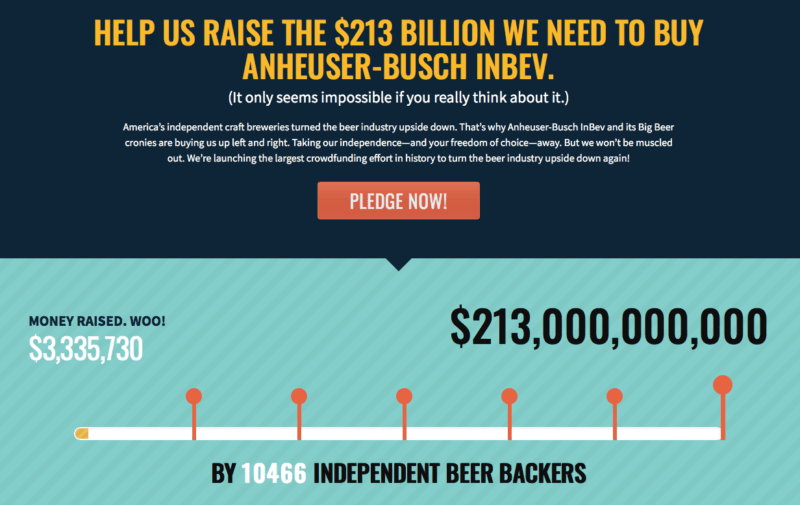 In October, the Brewers Association launched a crowd-funding campaign to buy Anheuser-Busch InBev. How’s it been going? The current answer, is not good. The goal of Take Craft Back, as the crowd-funding campaign is called, was to raise $213 billion to buy Anheuser-Busch InBev. Nearly a month in, they’ve “raised” just $3,332,580. While over $3 million is a lot of money, it’s still just 0.00156% of their goal. So things aren’t going so well for the fund raising. And this campaign doesn’t even require real money to be put up. All that beer-lovers have to do is say they’ll pledge $1,000 but there’s no requirement to put up actual money, nor will there ever be. This has mean many more have donated large sums than would if they had to put down real dollars. There’s other problems with this plan too. There are numerous legal issues that would prevent the Brewers Association from ever buying InBev in this way. Fundraising for a buyout like this is not allowed under the Securities and Exchange Commission rules. Even if they somehow managed to come up with the cash, they’d be totally unable to use it in the manner the campaign describes. On top of that, this entire idea assumes $213 billion would even be enough. Generally buyouts don’t happen for the current value of a company but rather for one beyond their current worth. InBev would almost certainly reject a $213 billion offer with little consideration. We’re going to need a lot more money to make this happen. This whole thing isn’t about really buying Anheuser-Busch InBev. It’s about bringing awareness to beer drinkers. Has the BA accomplished that? They may have. Over 10,000 people pledging and certainly numerous others reached by this campaign might have become better educated about the need to stay independent. But this all seems a silly way to go about doing so.